Her video presentation offers viewers a virtual classroom where the presentation of the workshop materials is enhanced by clear demonstrations and a 'face-to- face' experience. 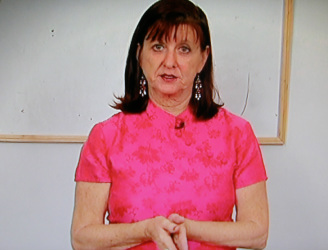 The DVD version of Bev's proven and effective methods which have guided thousands of people on their path to recovery over the past 18 years includes updates and expanded materials which will assist you to find rapid relief and build lasting recovery. 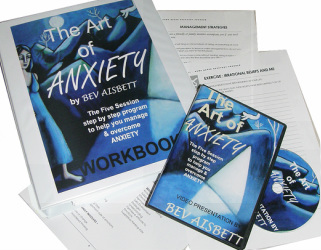 THE ART OF ANXIETY DVD WORKSHOP also includes a 128 page revised and refreshed manual to support Bev's teachings and deepen your understanding in honing your anxiety management skills. WHAT? What am I telling myself? Learning to effectively manage your anxious thinking is the essential key to recovery. your overall wellbeing. This is a powerful and healing session and the turning point for many people. going into your previous overwhelm. EACH SESSION REQUIRES APPROXIMATELY 1.5 HRS PER WEEK OVER FIVE WEEKS. BUDGET PDF VERSION ALSO AVAILABLE !